TodayÍs business environment demands flexibility and timely access to data. 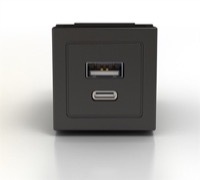 With convenient, quick-access to electrical power, data ports, video connections, and audio jacks your clients and business associates will be connected and energized for whatever challenges the day may bring them. With our advanced Power & Technology Modules you can modify your existing tables to get fully-featured conference and meeting tables for the board room, meeting room, conference center, or the corner office. For clean design and simple installation of cable and wire management solutions - you're in the right spot. When only a small cable length is needed, Charge & Sync Cables are the convenient size to get smaller jobs done. There's no reson in having an extra length of cable slack. This short cable is exactly 8 inches, the perfect size for your work surface. When only a small cable length is needed, Charge & Sync Cables are the convenient size to get smaller jobs done. There's no reason to have an extra length of cable slack. This convenient short cable is exactly 8 inches, the perfect size for your work surface. Presenting an open and shut case for good business: The next generation of flexible desktop power and data solutions for multi-media conference room settings. These convenience outlets are designed with one touch double doors that function as cable management portals that close while in use. Presenting an open and shut case for good business: The next generation of flexible desktop power and data solutions for multi-media conference room settings. These retractable PM-MHO2 convenience outlets are designed with one touch double doors that function as cable management portals that close while in use. Presenting an open and shut case for good business: The next generation of flexible desktop power and data solutions for multi-media conference room settings. Presenting an open and shut case for good business: The next generation of flexible desktop power and data solutions for multi-media conference room settings. Presenting an open and shut case for good business: The next generation of flexible desktop power and data solutions for multi-media conference room settings. Presenting an open and shut case for good business: The next generation of flexible desktop power and data solutions for multi-media conference room settings. This Audio Cable will connect your laptop to video displays via our power, data, video modules. Presenting an open and shut case for good business: The next generation of flexible desktop power and data solutions for multi-media conference room settings. This Audio Cable will connect your laptop to video displays via our power, data, video modules. Presenting an open and shut case for good business: The next generation of flexible desktop power and data solutions for multi-media conference room settings. This Audio Cable will connect your laptop to video displays via our power, data, video modules. Presenting an open and shut case for good business: The next generation of flexible desktop power and data solutions for multi-media conference room settings. These retractable PM-MHO2 convenience outlets are designed with one touch double doors that function as cable management portals that close while in use. Presenting an open and shut case for good business: The next generation of flexible desktop power and data solutions for multi-media conference room settings. This VGA Cable will connect your laptop to video displays via our power, data, video modules. Presenting an open and shut case for good business: The next generation of flexible desktop power and data solutions for multi-media conference room settings. This VGA Cable will connect your laptop to video displays via our power, data, video modules. Presenting an open and shut case for good business: The next generation of flexible desktop power and data solutions for multi-media conference room settings. This VGA Cable will connect your laptop to video displays via our power, data, video modules. Our Power Module connenctors and cables deliver voice, data, audio, and video connections to the table top in your conference room, training center, or classroom facility. If our cables and connectors listed here do not meet your requirements, call our office design specialists to help you customize one for your particular needs.